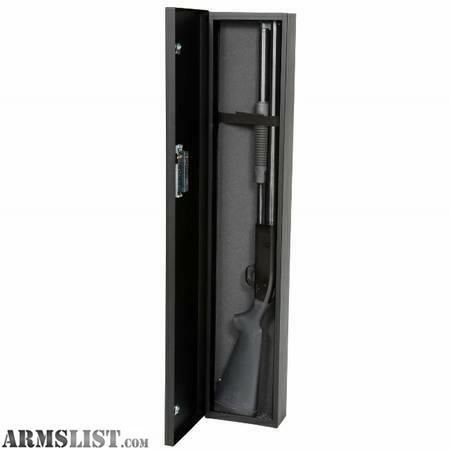 V-LINE HOME DEFENSE SHOTGUN SAFE 42"
The Shotgun Case is made of sturdy 16ga. steel and designed to accommodate a home defense shotgun. The Shotgun Case can be easily hidden in a closet or behind a door for concealment purposes. Mounting can be in a horizontal or vertical position utilizing the pre-drilled ¼” holes in the bottom of the case. The primary lock is a SIMPLEX five push button mechanical lock which offers quick and easy access. The lock has no batteries to fail or keys that can fall into the wrong hands. The combination is easy to set and change, with 1081 possible codes. The Shotgun Case in finished in a tough textured black low-gloss powder coating. Item is located at west side store at 2344 E 5th Ave, Columbus OH 43219.